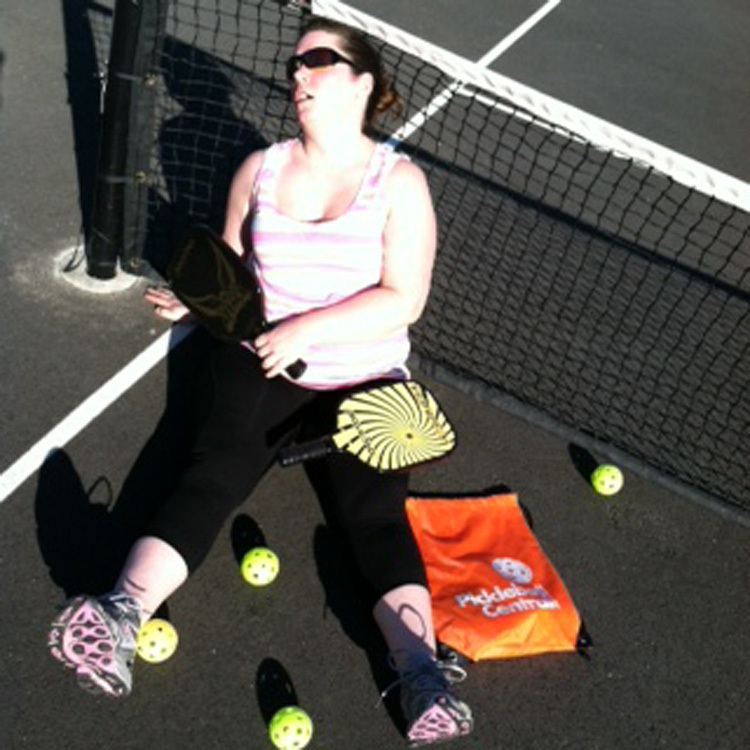 I’m Rachel, and I played pickleball for the very first time today. I never even played in gym class growing up. Nope – today was my first foray into the sport ever. Here’s my story about how it went. Two pickleball courts were installed at Maple Leaf Park just blocks from my house back in October. I’ve driven by them several times, and they’re nearly always full. I’ve been hearing about pickleball for months now, so when the weather was beautiful here in Seattle today, I thought I’d give it a try. When my pickleball buddy and I showed up, as always, the courts were full. A couple in their 30s occupied one court, and a pair of 20-something guys were playing on the other. As neither my partner nor I had ever played the game, we didn’t feel comfortable interrupting the other players’ games by asking to play doubles. So we waited about half an hour for one of the duos to exit the court. In waiting, we decided to walk the perimeter of the park. As the 30-something couple was leaving, we almost lost our chance for their court – another pair walked up just as we did and almost claimed the newly vacated spot. Popular sport! We warmed up with some simple rallies, just getting the feel for the ball. I played tennis when I was in high school, so I thought I had this in the bag. Au contraire. It’s been a loooooong time since high school, and the pickleball ball moves and bounces much differently than your standard fuzzy green tennis ball. As it was a fairly windy day, several serves ended up going the opposite of their intended direction, and I ended up running the opposite direction from where a lot of my opponent’s shots landed! The two hardest things for me to get used to were the no-volley zone and the double bounce rule. Even though it’s only two bounces, it was still hard to keep track of in the moment. And, it was so very tempting to want to slam one down on my opponent from right over the net. Scoring took a bit of getting used to too, but I think we got the knack pretty easily. It was similar enough to ping pong scoring (which my opponent, apparently, is some sort of aficionado of) that we were able to keep track. I also have to say that the game is engrossing – and fun! We ended up playing for about 2 1/2 hours, which isn’t too shabby for a first timer. In the time we were there, the court next to us swapped out players three times. When we left, a mom and her two daughters who looked to be about four and two were playing. It truly is fun for the whole family! All in all I had an awesome time playing, and I have to say I can’t wait to try it again! I might never win a tournament, but I’ve definitely found a new favorite sport.